Should women with gluten sensitivity breast feed? The questions about breast feeding come up often in regards to gluten intolerance, sensitivity, and celiac disease. I have had patients tell me that their pediatrician would prefer they not breastfeed because of gluten issues in the baby. I have also had patients be told that their baby is allergic to breast milk and that formula is a better option. This is terrible advice, but unfortunately is is common advice. The presence of these issues should alert you to the need to have proper testing done to determine gluten sensitivity in you and your baby. The popularity of the gluten free diet has increased awareness, but many are going gluten free without a diagnosis. You don’t need a diagnosis to go gluten free. Despite what many so called experts say, there is no danger in avoiding grain. If you are concerned about the potential for gluten sensitivity in your baby, the easy solution is to consume a gluten free diet while you are breast feeding. You can access a list of foods to avoid here. If you would like to investigate the possibility of gluten sensitivity, the best determinant is genetic testing. If you cannot afford it, I have put together a quiz for you to take to help determine whether or not a gluten free diet is right for you. Additionally, you should investigate the possibility of other food allergies. The presence of food allergies can cause reactions in the baby that are just as detrimental as gluten. 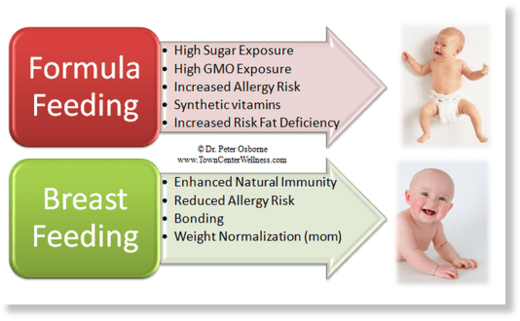 Remember that if you choose the route of formula feeding, you are voluntarily giving your baby genetically modified corn, sugar, soy, and or dairy. No child can thrive in a healthy manor eating those items as staple foods. If you want to investigate the horrible ways in which gluten can damage children, I would strongly encourage you to watch this video. As always, please share this information with your loved ones! This entry was posted in Uncategorized and tagged breast feeding, diet, enhanced natural immunity, Farmington Hills chiropractor, health by tiptonchiro. Bookmark the permalink.